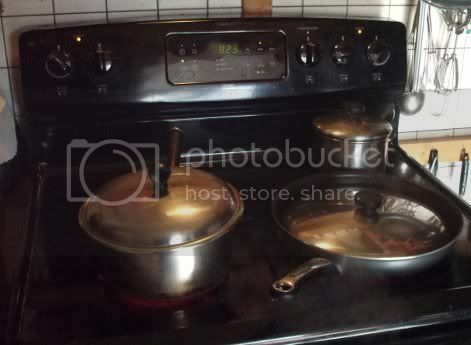 This is a rather unusual sight in the kitchen of the queen of one-pot meals (read: me). 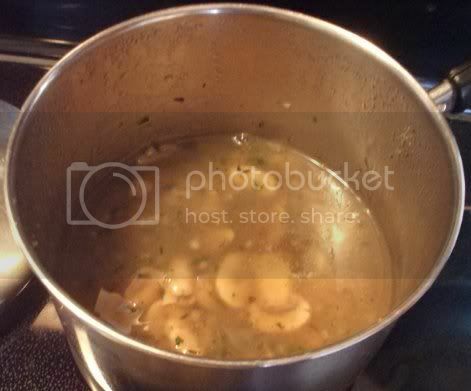 But I took a self-imposed day off this past Wednesday, and what better excuse to cook a more elaborate dish than usual? The choice: tempeh and sweet potato shepherd’s pie out of 1,000 Vegan Recipes. I woke up wanting to do something with tempeh and this recipe just about lept off the page at me! The last vestiges of winter are still clinging to the Northeast, thus making comfort food a desirable choice. And of course I’ll use any excuse to eat sweet potatoes. 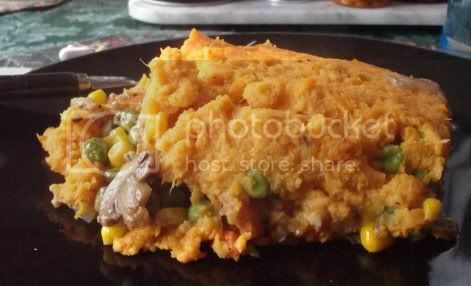 Other vegan shepherd’s pie recipes I’ve come across call for adding mushrooms and broth to the filling separately. This one makes use of a mushroom sauce recipe near the back of the book to accomplish the same thing. I prepared that earlier in the day, cutting it in half to yield close to the right amount for the pie. I’ve found that if there are any components of a recipe that can be thrown together in advance, it’s a good idea to do so. I’m still pretty terrible at coordinating multiple dishes! 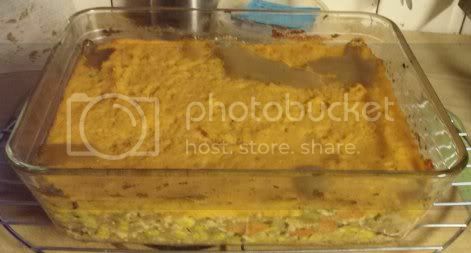 I put the sweet potatoes on to cook while cooking the rest of the filling. As a side note, I only used one tablespoon of Earth Balance when mashing them instead of the two in the recipe. It didn’t seem necessary to use that much when there were already two tablespoons of olive oil used in the filling. 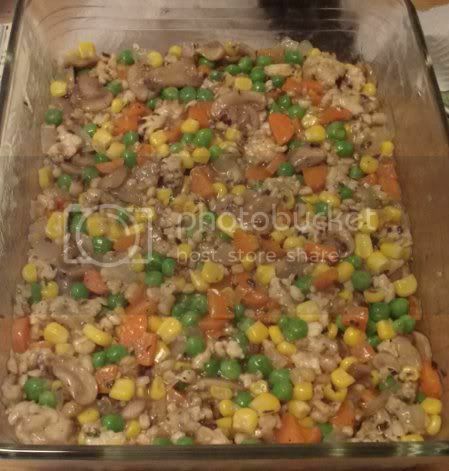 Sauteed onions, carrots, and tempeh mixed with peas and corn was a tasty enough combination on its own; adding the mushroom sauce only made it that much more amazing. Seriously, the kitchen smelled delicious before the whole thing even went in the oven! 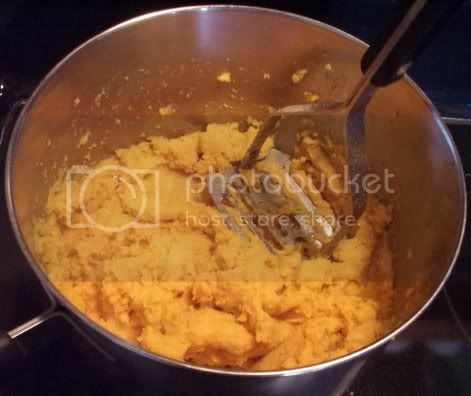 Once the sweet potatoes were spread on top, it was ready to go. This is definitely not a “one pot” meal, but it is a meal unto itself! Savory mushroom sauce with nutty tempeh and just the right amount of sweetness from the potatoes made a deliciously balanced dish. It stores and reheats well, too, so there’s no excuse not to make a huge batch to have on hand for the days when you want a hearty dinner but don’t have the luxury of time. The verdict on this one in the Quantum Vegan household? Two thumbs up!